You are currently browsing the tag archive for the ‘hunting’ tag. A Russian fur seller called G. Geezil draws Popeye inside his shop, but when Popeye discovers that all his bearskins are in fact, rabbit, the man proposes Popeye shoots a bear himself. The story idea of ‘Olive’s Boithday Presink’ harks all the way back to the Talkartoon ‘A Hunting We Will Go‘ (1932), and it’s just as weak. The bear’s goodbye scene is the highlight, in its perfect silent melodramatic comedy. However, there’s little else to enjoy: the shop scene feels like it was made years before, and the final battle is over before you know it. In 1939 Ben Hardaway revisited the rabbit he had introduced in ‘Porky’s Hare Hunt‘ (1938). The rabbit was completely redesigned, and received the colors that would make Bugs Bunny. However, the rabbit retained his loony character and Woody Woodpecker laugh, and is a far cry from the cool guy Bugs Bunny would become. But as he was Ben “Bugs” Hardaway’s bunny, it was this character that gave Tex Avery’s later star his name. ‘Hare-Um Scare-Um’ stars an anonymous red-nosed man who goes hunting when meat prices soar. In the forest he encounters the loony rabbit, who at one point even sings a song about how crazy he is. There’s remarkably little to enjoy in ‘Hare-um Scare-um’, as neither hunter nor rabbit are sympathetic, and one doesn’t care for either. However, the short introduces cross-dressing, when the rabbit disguises himself as a female dog to attract the hunter’s pooch. This cross-dressing would become a popular feature of the later Bugs Bunny. ‘Porky’s Hare Hunt’ was Ben Hardaway’s last solo cartoon before he teamed up with story artist Cal Dalton to co-direct fourteen shorts. 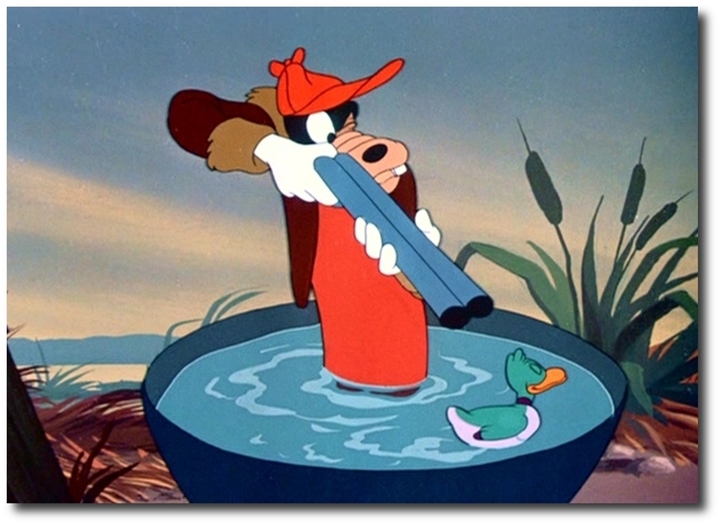 The film is a clear attempt to duplicate Tex Avery’s ‘Porky’s Duck Hunt’ (1937). Now Porky is hunting rabbits, and Daffy’s loony character is now transferred to a rabbit, which even jumps and whoo-hoos like Daffy does. However, the rabbit has got a unique, weird laugh, which at several occasions is clearly Woody Woodpecker-like. Although this rabbit appears three years before the woodpecker himself, this is no coincidence, as both this rabbit and Woody Woodpecker were conceived By Ben Hardaway, and voiced by Mel Blanc. ‘Porky’s Rabbit Hunt’ is an uneven and only moderately funny cartoon that contains a few typical Warner Bros. gags, like a sniffing gun and ‘hare remover’, which makes the rabbit disappear completely (in cartoons rabbits and hares are completely interchangeable). More importantly, it is the first of three cartoons featuring rabbits that anticipate the coming of Bugs Bunny. This rabbit has little in common with the world famous hare: he’s far from sympathetic, even heckling Porky in the hospital. Moreover, he’s a clear loon, like Daffy, not the cool hero Bugs Bunny would become. However, this rabbit already does perform a fake death scene, something that would become a Bugs Bunny trademark, and he quotes Groucho Marx from ‘A Night at the Opera’ (1935), saying ‘Of course you know that this means war’, which would become a Bugs Bunny catchphrase. ‘The Fox Hunt’ is the second entry in the Donald & Goofy mini-series. In fact, Mickey, Minnie, Horace Horsecollar and Clarabella Cluck are also present, but only shortly, and first only as shadows. Donald gets most of the screen time, devoted to his antics with five unruly bloodhounds and a sly fox. Goofy gets only one scene, in which his horse refuses to jump. This part shows a novelty: when we watch Goofy and his horse being under water, we’re watching a new technique involving distortion glasses to make the water more convincing. This technique would become very important in the elaborate ocean scenes in Disney’s second feature film ‘Pinocchio‘ (1940), for which these few seconds are only the try-out. ‘The Fox Hunt’ clearly borrows from the early Silly Symhony of the same name. The Donald and Goofy version copies the shot with the hunters being shadows in the distance, and the end gag with the skunk. The Donald and Goofy cartoons were not among Disney’s best, and ‘The Fox Hunt’, too, is only average. ‘The Fox Hunt’ was the last short directed by Ben Sharpsteen, and like Jack King, he favors an all too relaxed timing in this short, hampering the comedy. Sharpsteen had already been a sequence director for ‘Snow White and the Seven Dwarfs’ (1937), and for ‘Pinocchio’ he was promoted to supervising director. From now on he would work on feature films, solely, until the early 1950s, when he moved on to True-Life adventures. Carl Barks, who was a story man at the time this short was made, revisited the fox hunting theme in his 1948 comic ‘Foxy Relations’, which is much funnier than this film. ‘Daffy Duck and Egghead’ marks Daffy Duck’s second appearance. The short is the first film carrying Daffy’s name, and his first one in color. The cartoon uses exactly the same premise as the first one, ‘Porky’s Duck Hunt’ (1937), but now with Egghead as the hapless hunter. Egghead never was much of a character, and Avery deliberately changed him for this cartoon, giving him a Moe-Howard-like hairdo, but otherwise making him less loony than before, and more of a straight man. Daffy Duck, on the other hand, is completely wild in this cartoon, and sings about himself on the melody of ‘The Merry-Go-Round Broke Down’, an idea that was copied in the feature film ‘Who Framed Roger Rabbit?‘ from 1988. Avery and story man Ben Hardaway tell some great gags here: for example, Egghead shooting down a man in the audience who won’t sit down, and a random turtle suddenly breaking in and ordering the duo to duel. This colorful short surely couldn’t be hardly be more removed from Disney for a 1938 cartoon. The Warner Bros. cartoon studio clearly was on its own course. However, Avery’s timing is still unsteady, wearing down the fun, especially in Egghead’s tiresome slow reactions to the duck’s antics. 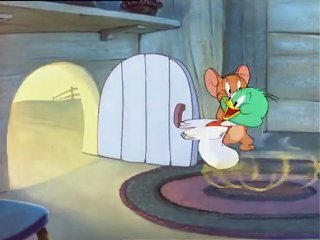 In ‘Rabid Hunters’ Tom and Jerry are hunters, who try to catch a rabbit with their semi-anthropomorphized dog and horse. The rabbit appears to be an early forerunner of Bugs Bunny, outwitting all four characters to a jazzy upbeat score. This soundtrack, by Gene Rodemich, is the absolute highlight of this otherwise erratic, boring and terribly poorly animated short. Also noteworthy is a hallucinatory scene at a tree branch that has to be seen to be believed. Like the Silly Symphony ‘The Fox Hunt‘ from a year earlier, the cartoon ends with a skunk. In ‘The Duck Hunt’ Mickey and Pluto are hunting ducks. Their attempts are quite circumstantial and fail due to the inferior quality of Mickey’s gun. When the ducks discover that the female duck is only Pluto in disguise, they take revenge by taking Pluto by the ears and drag him and Mickey, who has gripped Pluto’s tail, into the air. ‘The Duck Hunt’ is a gag cartoon similar to ‘The Moose Hunt‘. Unfortunately it isn’t very funny. A lot of screen time is devoted to Mickey and Pluto marching to civil war tunes, and Pluto’s and Mickey’s flight through the air fails to become the intended great finale, because of a lack of great gags, although I liked the gag of Pluto’s flees leaving his fall by parachuting from his behind. ‘The Duck Hunt’ shows that not every Disney cartoon was a winner, despite the studio’s obvious efforts. In ‘To Duck or not to Duck’ Elmer Fudd shoots Daffy out of the sky. The duck then challenges the ‘sportsman’ for a boxing match, something which takes place immediately for a crowd of ducks. Needless to say, the match is far from fair. ‘To Duck or not to Duck’ is the first Warner Bros. cartoon to star both Daffy and Elmer. The poor hunter is good fowl for the foul-playing duck and his brethren. When Elmer gets his revenge in the end, we’re almost surprised. The cartoon knows some good gags, but Jones’s timing is still sloppy, and not every gag hits the screen well. 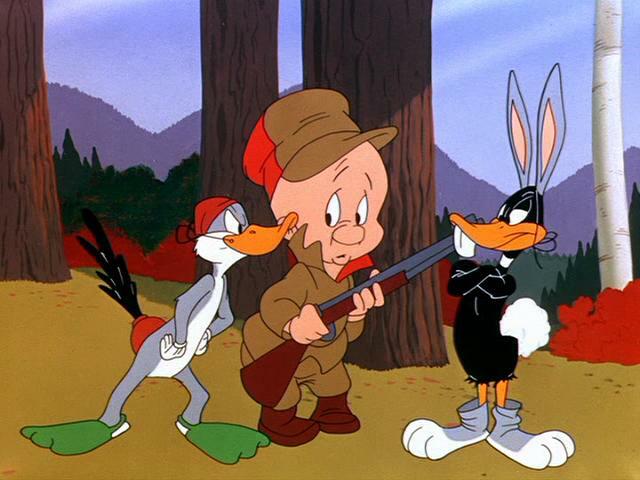 Highlight may be Daffy’s ridiculously haughty humphing at Elmer Fudd’s apology for shooting him. Note the surprisingly empty backgrounds in this cartoon. ‘Rabbit Fire’ is the first of three cartoons in which writer Michael Maltese and director Chuck Jones play Bugs Bunny, Daffy Duck and Elmer Fudd against each other. The cartoon introduces a new incarnation of Daffy: as the jealous and treacherous miser who never wins. This transformation works, because Daffy the trickster was already present, as can be seen in films like ‘You Ought to be in Pictures‘ (1940) and ‘The Ducksters‘ (1950). As we could expect Daffy’s tricks, so successful against Porky Pig, fail when tried on Bugs Bunny, and Daffy’s repeated failures add to the duck’s frustration. However, with this transformation, Daffy would lose his lunacy altogether, and it was this new frustrated, misguided, loser type of Daffy that would prevail to the present day, combined with Daffy-the-misguided-hero, championed in other Chuck Jones cartoons, like ‘Drip-along Daffy‘ (1951) and ‘Duck Dodgers in the 24 ½ Century‘(1953). In ‘Rabbit Fire’ the contrast between Bugs and Daffy is played out very well: Bugs is the initial victim, but he remains über-cool and in total control, while Daffy is the treacherous actor, trying to harm Bugs, but biting the dust every time. In fact, this character trait makes Daffy rather similar to an earlier incarnation of that other famous duck, Donald, who, by the early 1950s had more or less evolved into the straight guy. The team’s streak of genius is that Daffy never turns into rage, but remains cool, as well. When confronted with a string of defeats, he just walks up to Bugs and utters: ‘you’re despicable!’. Elmer Fudd, meanwhile, remains the confused instrument of the feud between the two animals. ‘Rabbit Fire’ is a dialogue-rich cartoon, but the dialogue never wears down the action. In fact, two of the film’s highlights involve a lot of talking: the gun-pointing scene, and a scene in which Bugs and Daffy read aloud several recipes (strangely enough Daffy pulls out a book on rabbit recipes out of Bugs’s rabbit hole…). Other highlights are a gag involving an elephant gun, and the short’s finale, in which it’s suddenly Elmer Season. The success of ‘Rabbit Fire’ was repeated in ‘Rabbit Seasoning’ (1952) and ‘Duck! Rabbit! Duck! (1953). After this classic trio the studio paired Bugs and Daffy, and even Elmer in a bunch of other cartoons, and the antagonism between rabbit and duck remains intact to the present day, as can be seen in the feature film ”Looney Tunes: Back in Action’ (2003). In ‘No Hunting’ Donald is encouraged by an off-screen narrator and by the spirit of his grandfather to join the hunting season. This leads to a great satirical cartoon, ridiculing hunting and hunters. It even contains a parody on ‘Bambi‘! ‘No hunting’ feels like a Goofy short featuring Donald. Like in the Goofy shorts, most of the humor comes from the contrast between the narrator’s lines and what is shown on the screen. It’s a very enjoyable Cinemascope cartoon, which deserves to be more widely known. 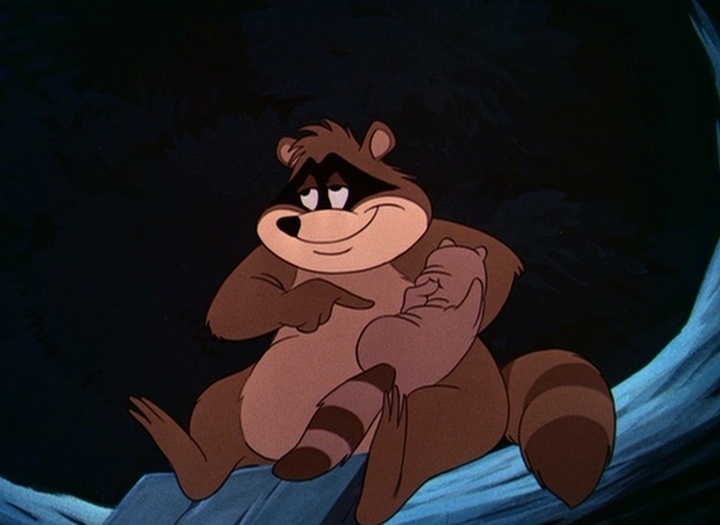 This cartoon starts with a Texan voice-over telling about raccoon hunting. Enter Mickey and Pluto who are exactly doing that. Pluto’s pursuit is hindered, however, by the raccoon’s clever decoys and sidetracks. In his final trick the raccoon fools Mickey and Pluto by pretending having a baby, using Mickey’s coonskin cap. Mickey has pretty little screen time in this cartoon, which is essentially Pluto’s. His visualisations of what he’s smelling are the highlights of this gentle if not very remarkable film. Tom is hunting ducks and he hits a little drake. Jerry helps the duckling, dressing his wounds, but he has a hard time preventing the careless duck of being shot again. This cartoon builds up to a great finale involving an anvil. The little drake looks and behaves like Little Quacker (see ‘Little Quacker‘ from 1950), but differs in having mature feathering. In fact, this overenthusiastic, but not too clever drake leads to greater comedy than the more famous little duckling. As a result ‘Duck Doctor’ is very entertaining, and one of the more inspired of the latter day Tom & Jerry cartoons. Pluto is sleeping at ‘Mickey’s outdoor reserve’, a forest reserve deep in the mountains, which is shown in a beautiful pan opening shot. There the howling of the wolves, a.k.a. the call of the wild awakes “his primitive instinct”, which takes the shape of a little blue wolf character. The instinct tries to make Pluto give up his easy life to hunt some meat outdoors. But Pluto turns out to be a lousy tracker, and when he’s bullied by both a rabbit and a bear he rushes home, only to discover that the little wolf has eaten his bread and milk meal. ‘Primitive Pluto’ is a nice cartoon, if not among Pluto’s best. It shows how far Pluto had come from his roots as a tracking bloodhound as shown in ‘The Chain Gang‘ (1930). Like Mickey, Donald and Goofy, Pluto had become urbanized and settled over the years. It’s nice to watch the animators play with this fact. With ‘Daffy Duck Hunt’ Robert McKimson returned to the subject of Daffy’s very first cartoon, ‘Porky’s Duck Hunt’ (1937). 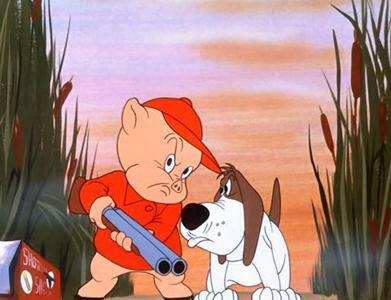 Like in the original cartoon Porky Pig is hunting ducks, and Daffy in particular, to no avail. He’s now accompanied by a dog (a typical McKimson design). To trick Daffy, the dog convinces Daffy that he will be tortured if he doesn’t retrieve a duck, so Daffy allows the Dog to take him to Porky. Porky takes Daffy back home and puts him into a particularly cold fridge. From now on almost all the action takes place around the fridge in a wonderfully loony cartoon (penned by Warren Foster) full of wild gags and zany animation. ‘Daffy Duck Hunt’ is one of those Warren Foster/Robert McKimson cartoons that celebrate Daffy’s looniness perfectly. Highlight is a gag in which Daffy jumps out of the fridge in a Santa suit making Porky and the dog believe it’s Christmas. This gag is a nice and equally hilarious variation on a classic gag from Freleng’s ‘The Wabbit Who Came to Supper’ from 1942, in which Bugs Bunny made Elmer believe it’s new year’s day. In ‘Foul Hunting’ Goofy is hunting ducks, which all resemble Sonja from ‘Peter and the Wolf’ in ‘Make Mine Music’ (1946). ‘Foul Hunting’ is Jack Hannah’s third Goofy cartoon, and it is very different from his first two (‘A Knight for a Day‘ and ‘Double Dribble‘ from 1946). This cartoon returns to the original Goofy character, arguably unseen since ‘Baggage Buster‘ from 1941. More surprisingly, Goofy suddenly has his voice back – apparently, Pinto Colvig had returned to Disney. Unfortunately, it’s this voice that slows down the action, making the cartoon less funny than the voiceless entries and giving it a painfully old-fashioned appearance. After five years of cartoons with multiple Goofies, this return to the ‘real’ Goofy feels like a retrogression. Pinto Colvig would be Goofy’s voice again in the equally unfunny ‘The Big Wash‘ (1948). In ‘The Moose Hunt’ Mickey and Pluto are hunting moose. They finally find a moose (or more exactly, the moose finds them). Unfortunately, in front of the moose, Mickey’s gun fails and soon the moose hunts both Mickey and Pluto. The chase ends with Mickey escaping on a flying Pluto. 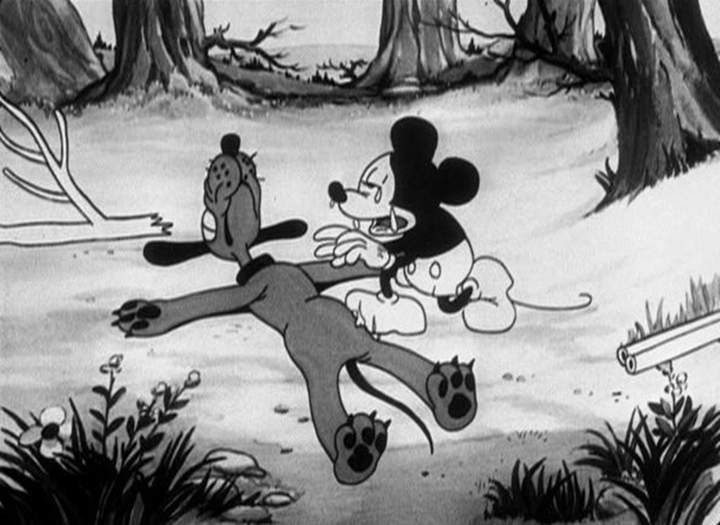 ‘The Moose Hunt’ is Mickey’s third gag only short, after ‘The Fire Fighters‘ (1930) and ‘Traffic Troubles‘ from earlier that year. It’s hardly as good as those earlier entries, though. Its pace is slow, and it contains some awkward gags, like the flying Pluto finale. It also contains a rare gag breaking the fourth dimension: when Mickey accidentally shoots Pluto, he suddenly addresses the audience with a “Is there a doctor in the house?”. Then, when Mickey begs Pluto to speak to him, Pluto actually speaks! The self-conscious audience gag would remain a rarity at Disney, but it would become a staple gag at Warner Bros. when Tex Avery joined that studio. The two Pluto gags are totally out of character, and have nothing to do with him being a dog. After ‘The Moose Hunt’ we would never see Pluto flying or speaking again (apart from a short ‘Mammy’ at the end of ‘Mickey Steps Out‘), and after watching ‘The Moose Hunt’ it is easily understandable why not. Luckily, there are other scenes that are more inspired, and in which Pluto behaves like a dog throughout. 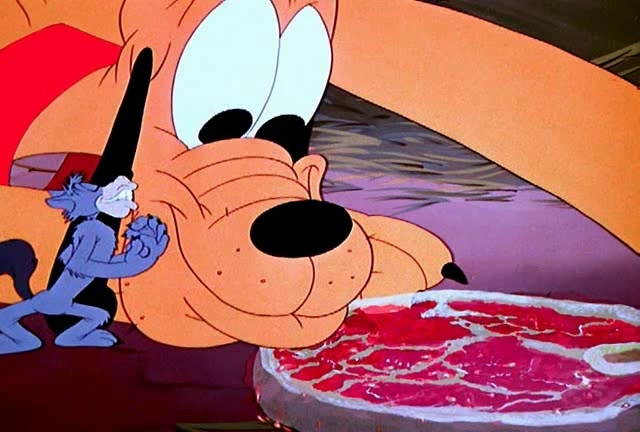 Indeed, in his very first solo scene, which reuses a little animation from ‘The Chain Gang‘ (1930), Pluto’s character as a little dumb and a little cowardly dog is pretty well established. Pluto’s looks are still unstable, but he’s excellently animated, throughout. In ‘The Moose Hunt’ Pluto also gets his name (he was called ‘Rover’ in his first appearance in ‘The Picnic‘ from six months earlier). He now clearly is Mickey’s dog, not Minnie’s, like in the earlier film. It’s clear that the Mickey Mouse films could use an extra character, and after this film Pluto would appear in almost all succeeding Mickey Mouse films, stealing more and more screen time from Mickey. Mickey would go hunting moose again in the way funnier ‘Moose Hunters’ from 1937, which, incidentally, doesn’t star Pluto.